The Thermo Scientific Neslab ThermoFlex 900 recirculating chiller offers high reliability and stability in a compact footprint. Using a powerful industrial grade force and suction Positive Displacement P2 pump, operating 4.0gpm at 60 psig. This cooling system has the pressure needed to properly circulate fluid over a long distance, and is suited for both open container and closed loop systems. 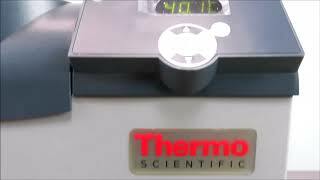 The Thermo Scientific Neslab ThermoFlex 900 recirculating chiller is designed to maintain a continuous flow at a consistent temperature and volume. When the chiller is installed below the application an anti-drainback system prevents fluid from returning to the reservoir. The Neslab ThermoFlex 900 recirculating chiller is microprocessor controlled, and has broad range of temperatures, and a flow readout to monitor flow rate via a controller. The 900-watt unit uses an air cooled condenser, taking the ambient temperature in the room air to remove application heat. Maximum fluid pressure is variable to meet application needs and is controlled via a pressure relief valve. The Thermo Scientific Neslab ThermoFlex 900 recirculating chiller also uses a 7.2 liter (1.9gallon) polyethylene reservoir, heat exchanger and refrigeration system. Contact us with questions about our Thermo Neslab Chiller. 26" x 14" x 27"
This Neslab Chiller was tested at min 4°C and max 40° multiple times and is working great. All of our lab equipment comes backed with our standard warranty. Should you have any questions, please don't hesitate to contact us.